I assess your energetic system at the physical, emotional, mental, subtle and spiritual levels, which tells us what areas we need to work on. Then I move energy, as necessary, within the chakras and auric field bringing them into balance. Channeling energy from spirit/the divine source and directing the energy to where it needs to go, I balance your Chi, or life force energy. This is working with the help and guidance of nature, elements, birds, animals and plants. I may do a shamanic journey to the spirit worlds, working with power animals and spirit guides, or a soul retrieval to reconnect parts of your self lost during trauma. Using sounds such as voice, drum, chanting, rattle and other instruments such as solfeggio tuning forks, I will work to change the vibrations within your subtle energy system to bring it into balance and harmony. Working with psychological tools such as Psychosynthesis, CBT, Mindfulness, meditation, breathwork and other tools, I can help you empower yourself to create a higher level of wellbeing. Healing works on every level so can be used to improve physical, emotional, mental and spiritual wellbeing. I can work with you in person or can work distantly with you anywhere in the world. Distant healing includes emails and phone calls.I will always share with you tools, skills and practices to use at home, so that after a few sessions you are empowered to maintain your healing balance yourself. I specialise in healing emotional, mental and spiritual issues and am the only Authentic Power Practitioner in the UK fully trained by Gary Zukav. I have a Masters degree in Consciousness Studies and Transpersonal Psychology and work academically researching the effects of healing. 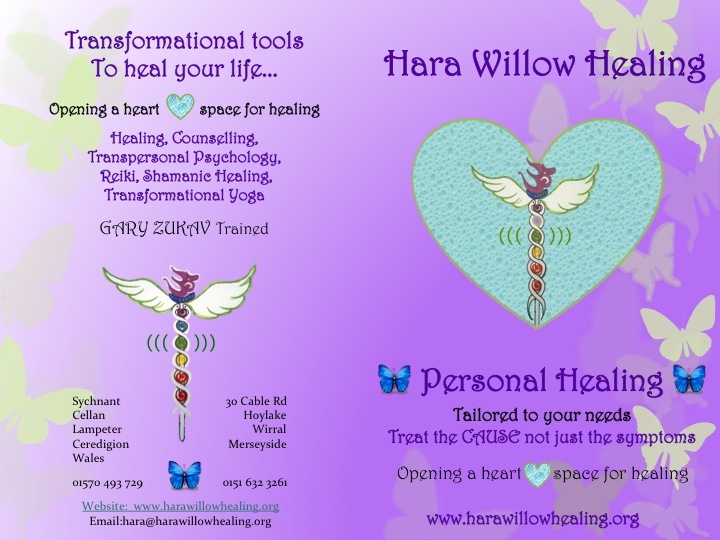 For more information about personal healing and courses I offer, or about holistic wellbeing and to see testimonials from happy healing participants, please visit my Hara Willow Healing facebook page, where you can ‘like’ my page! Check out the Amazing Lyfe page too for healing retreats. I begin this section with a passage I found on my travels in America. I keep it stuck on my fridge to remind me every day. I find this incredibly inspiring – as it helps me to remember the deeper reasons why I choose to live the way I do, despite what is going on in the world around me…. Accuse you of selfish, ulterior motives. Some false friends and some true enemies. Physical - Finding the other parts of my life that are not in alignment with my soul’s needs, i.e. my job, my diet, my exercise, my relationships etc. and realigning them with what my soul needs, rather than my personality, thus creating harmony in my being. Psychological - a) EMOTIONAL Finding the parts of my personality that are not in alignment with my soul – i.e. that are coming from a place of woundedness and fear, and healing them, realigning them with love, creating harmony in my being. - b) MENTAL finding thoughts and perspectives that are limiting or no longer appropriate for my present state of consciousness. Spiritual - Expanding my consciousness and embodying divine energy and living from that more expanded place. Of course it helps to know what the authentic needs of the soul are and what the inauthentic needs of the personality are. Gary Zukav’s books, particularly The Seat of the Soul and The Heart of the Soul are of great use in understanding authentic needs, but I will just give a few pointers to get us going here. If you are reading this website the chances are you already know. Fresh Air, exercise, food, water and the right amount of sleep for our individual needs. (The particulars of these physical requirements depend obviously on our own unique physiognomy. This we have to work out for ourselves). Loving, close relationships – connection, union to others. Fulfilment - To find the reason or purpose that we are here – i.e. to find our own unique and special gifts and to give them to the world in our own unique and special way. Perhaps through our job (if we have followed our bliss and created or found the right work), or in our spare time. A sense of deeper meaning and purpose running through our life. If all parts of my personality are in the process of healing and I am living my life according to what my soul and not my personality needs then I will be healthy and whole. If I am not, then my job is to find what is out of balance or harmony within me and do something about it. Once I am healthy and whole I contribute to the health and wholeness of everything and everyone else. I can go and get help from some form of healer/therapist/loving friend to assist me with this process if I am stuck somewhere, or if I need more energy or clarity than I can find alone. A healer is not someone who fixes me, but assists me on my journey to wholeness. We all need assistance at times. We are not totally independent beings and should not try to function as such, or we become lost and alone. We are all inter-dependent, not just human beings dependent on each other, but all of life is inter-dependent - like one great interconnected web of pulsing, vibrating, wonderful life. When we are out of harmony with the web of life, (with what I understand as the divine made manifest), we become ill in a variety of weird and wonderful ways. We respond to illness (or any other challenge) in our life in one of two ways, we contract in fear and doubt or we expand in love and trust. Only one of these helps us to grow and become all we can be. I FEEL THAT THE MAIN WAY TO HEALTH IS THROUGH OPENING IN LOVE AND TRUST TO OUR EXPERIENCES and learning from them, letting them guide us back towards the harmony that comes from being aligned with the divine in our life. The Lyfe4Lyfe is a symbol of this, and as such is great to meditate on. 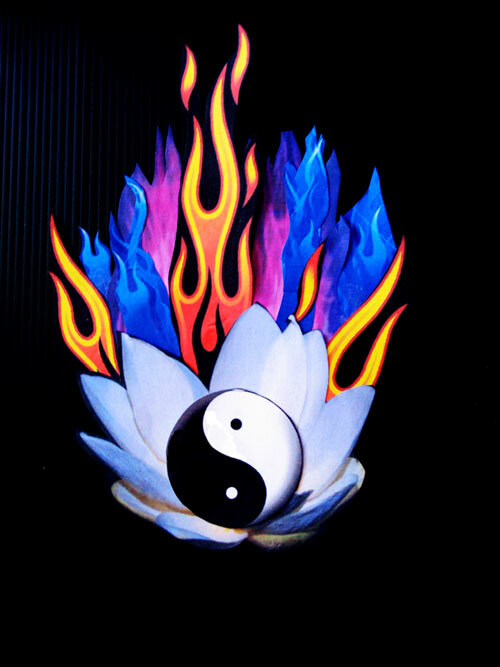 The LOTUS represents opening in trust, whilst being grounded in the earth; The YIN YANG represents the centre point of harmony and balance that exists within the tension created between the opposite poles of force in the universe; and finally the FLOW of the water and flames represent the divine flow within and above the natural world, that structure the universe. These flames are various colours as they represent the flow of water and emotion; the etheric flow of the subtle or psychic levels and the flow of fire, which can represent the mind and/or divine spirit. Finally, there is an ENERGY of transformation that is created by the interplay of the elements that make up the symbol. Thus we grow towards wholeness and bliss - the natural state that we experience when we find our still centre and learn to rest in it, during meditation. The black background symbolises the nothingness or void that is the deeper state of our being and that out of which the universe has manifested. I charge £40 per session. I work in person in the Wirral and West Wales areas and I am available for distant healing also, which is often even more effective! I begin with an initial consultation by telephone and then will work with you in groups of 6 treatments, as I do with the personal sessions. The difference with distant healing is that we have a phone call afterwards to discuss what I have done and what I have picked up from your energy system, as we can’t do this in person. If English is not your first language and you struggle with understanding what I am saying to you, I can then type up and send you my findings to read before our phone call. The initial 6 sessions and primary consultation will cost £300. After that if you need any more sessions they will be charged at £40 per session or £200 for 6. However, as I will be sharing with you all the tools I sense you need, so that you can do the work for yourself, I hope that you should not need more than the six treatments – this depends on your particular situation. If you live outside of the UK and/or are on a low income you can make donations relative to your income and ability to pay, bearing in mind that this £300 is payment for at least 8 hours of my time. If we find that our energies are not compatible and you wish to find another healer, I would recommend seeing someone trained at the College of Healing in Malvern.